Simple Steps to Add Balance to Your Room | Bringing together stories, rooms, life. Ever walk into a room and feel like it’s a little unsettling? Something just doesn’t feel right. The key to creating a welcoming and inviting room is balance. Proper furniture and accessories placement is critical so that no one area of the room appears heavier than another. Start with a focal point. (And not necessarily the TV!) This could be a large painting, a wall of bookcases, or even a panoramic view if you are fortunate to have one. Next, arrange your main seating area around the focal point. 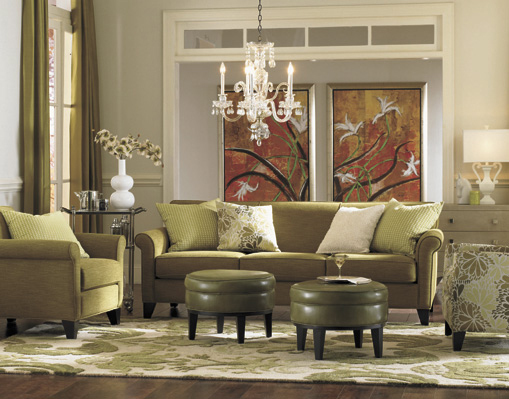 Two chairs placed next to each other with a small end table between can carry the same visual weight as a facing sofa, and create a conversation circle. Add furniture or accessories that have height, such as a tall bookcase or e’tage’re, a palm tree or floor lamp. Consider placing a folding screen next to the sofa. These pieces will draw the eye up, and help balance the room vertically as well as horizontally. Balance your horizontal space as well. How about adding a narrow table behind the sofa to display pictures of your family and friends or your favorite collections. Even a display of books create interest and weight to your room. By using these simple steps to add balance to your room, you’ll transform an awkward room into a welcoming room you and your family will love. Contributed by Christine Bongiorno-Grabau, Home Furnishing Consultant at HomeWorld Furniture Honolulu. This entry was posted on October 27, 2011 by C. S. Wo & Sons, Ltd. in Uncategorized.